COLUMBUS, GA -- A fast food empire in Columbus, Georgia, struck back after a little boy in a wheelchair was left out by other children playing nearby. The boy's mom, Kari Merriken said she and her 8-year-old son, Caleb were attending "Galaxy Night" at their local Chick-fil-A earlier this month. During the event, Caleb, who has spinal muscular atrophy and uses a wheelchair, was purposefully excluded from playtime with other kids, his mother said. "I felt like he might have been embarrassed, so I didn't want to rub salt in the wound, but I had to talk to Caleb about it," Merriken wrote to ABC News. "I told him that I wanted him to take this experience and let it make him a better person than he already is. He's such a good kid with a big heart. He is so brave and resilient. Dealing with his disease is not easy, but he doesn't let it keep him from enjoying life. He keeps a positive outlook and a strong mind." 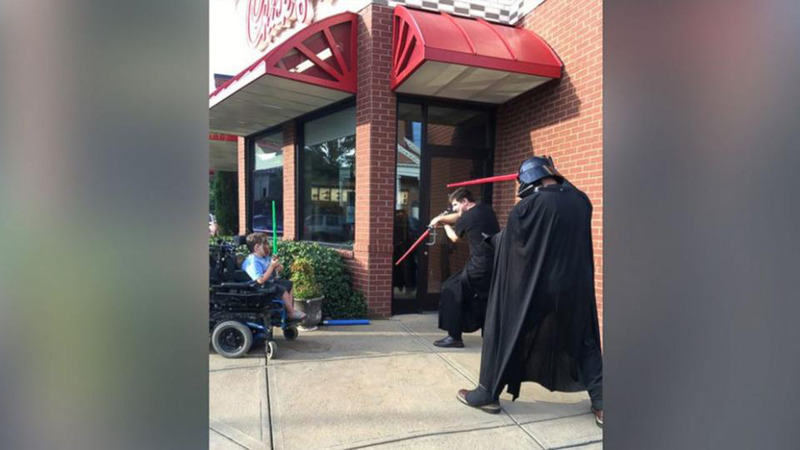 That's when some employees at the Chick-fil-A gave Caleb, "a new hope." The employees did their best Jedi impersonations and engaged in an epic lightsaber battle. Later, she expressed her gratitude in a Facebook post to Chick-fil-A, along with a photo of the exchange. "I was so thankful that their hearts were moved to intervene," Merriken said. "I feel like they re-wrote the message he had just received. It went from 'You're not wanted' to 'You're valuable. You matter. We think you're cool.' I'm so appreciative of them taking the time to give Caleb that positive message. I feel like it helped restore his confidence." She added: "For the rest of us, myself included, I think I would want us to learn that kindness can go a long way to heal hurts." "Chick-fil-A team members across the country love creating special moments for guests, and this act of kindness in Columbus, Georgia, was just one example of our local team members doing what they do best."